There's new hope for people with hard-to-control blood pressure known as resistant hypertension. Often—70% of the time—they also have obstructive sleep apnea (OSA), a condition that interrupts their breathing while they sleep. Now researchers say using a special machine to treat the OSA can help lower blood pressure as well. The findings, published Dec. 11, 2013, in The Journal of the American Medical Association, suggest that using a small bedside air pump and mask that keep the airways open with continuous positive airway pressure (CPAP) can lower average daily blood pressure by a few points. Though small, the improvements are important. 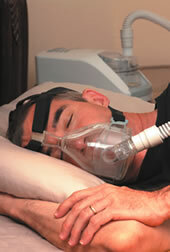 Nighttime interruptions in breathing stress the cardiovascular system, increasing the risk of heart attack and stroke. A CPAP machine shouldn't replace medications to control blood pressure, but this study suggests the machine may complement them.